Nearly two decades ago, cartoonist Eric Powell created The Goon, a whisky-drinking brawler who mixes it up with mobsters, skunk apes, zombies and other freaks that go bump in the night. 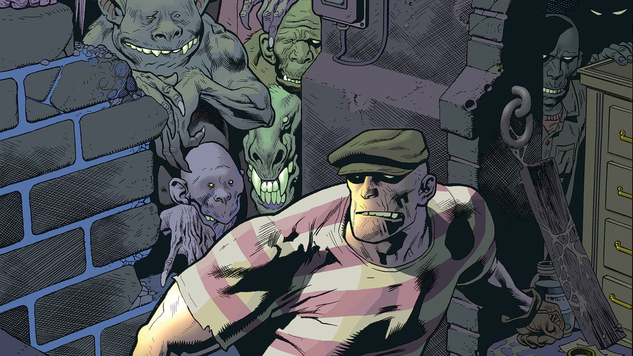 Briefly published by Avatar Press, then Powell’s own Albatross Exploding Funnybooks, then most famously by Dark Horse Comics, The Goon became one of the most notable original creations of the modern era, standing alongside Mike Mignola’s Hellboy as a supernatural success. Powell’s seemingly final The Goon issue came out in 2015, but you can’t keep a good Goon down, and Powell announced earlier this year that the series will return in 2019 as part of a major 20th-anniversary push. For the first time, Powell won’t be alone: he also revealed that several as-yet-unannounced writers and artists will join him on the series as Goon & Franky return from strange adventures abroad to find a horde of unsavory characters have filled the void left in Lonely Street. One name we know for sure is Kevin Nowlan, who lends his unmistakable ink work to a variant cover for The Goon #1. While most details of the new series are still under wraps, Paste is thrilled to debut a first look at Powell’s main cover and Nowlan’s variant cover, which you can check out below. Be sure to stay tuned to Paste in the coming months as we get closer to The Goon’s long-awaited return.